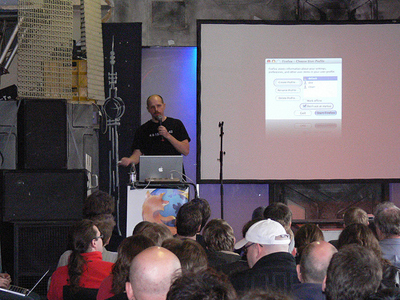 As most of you know, I was in Berlin last weekend, giving a talk at Mozilla Add-Ons Workshop :: Berlin (MAOW Berlin 2009). It was great fun, and I thought I’d tell you more about the event and the trip. I flew down on Friday March 27th with SAS from Stockholm to Berlin. It was a bit windy, especially when we were about to land, but overall a nice and gentle trip. I took a cab to my hotel, Park Inn at Alexanderplatz. Earlier, I had talked to Rey Bango about having dinner together on Friday night, but I didn’t know when he was about to arrive. 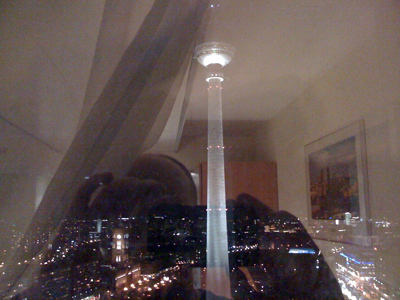 So, I checked in at the hotel about 8 pm, I got my room at the 29th floor with a beautiful view of Alexanderplatz and the TV tower. As soon as I had settled in, I sent a text message to Rey to see where he were. The surprise reply was that we would not be there until 11 pm. I thought he maybe was preparing stuff at the venue before the conference, but it turned out that we was in Paris, waiting for a connecting flight. Then, apparently, it is super-expensive to send text messages with a US subscription when you’re abroad (my theory: Rey is a bit cheap, don’t earn enough or is just plainly misinformed 🙂 ), so our communication abruptly ended with Rey sending a text message to me, begging me to stop texting (he also used lots of abbreviations, like the number of characters in a message influenced the price…). Ok, I was on my own. I texted with some loved ones and friends (since I could take the total cost of about â‚¬1), and then I called a friend I knew would be in Berlin over the weekend to see if we could meet up. Unfortunately, they were in another part of the city, just about to have the dinner, and I didn’t have the strength to take a cab and try to find them. Very tired after the work week, I decided I had to activate myself to stay awake. I went out for a walk in the Alexanderplatz proximity for about an hour, getting some cold nice air and pretty scenery, and ended the walk with eating a bratwurst from a stand in the square. After that, I went up to my room again, with about an hour and a half to wait till Rey would arrive. Unfortunately, all the TV channels were dubbed to German (stop doing that!) and my German skills aren’t that good, so watching TV was out of the question. Also, Internet in the room was extremely expensive (how about â‚¬6 per hour? ), so I decided to alternate between reading some magazines and playing Texas Hold’em on the iPhone. At around 11 pm I was so far slumped down in the bed, I just had to get up to stay awake. I went down into the lobby, sitting in a couch there reading some magazine I found in English, and probably pretty close to 12 pm, Rey and his entourage walked into the door! Tired, moving very slowly, I got up and greeted him. Since I had been lonely for some time, I was a bit clingy (“see me, love me!”), and acted a bit like a dog when its owners get home from work. I would not be left behind on my own, not again. I went with Rey to his room (only fifth floor, ha ha! – do that laugh like Nelson in Simpsons 🙂 ) and had a look at it. I did, however, get the tingling feeling that he would probably like to be left alone for a moment, so I offered to go down to the lobby to wait for them. The offer was graciously accepted my Mr. Bango. When everyone had got settled, we met up in the lobby for a late night dinner. It was Rey, Chris Beard, Pascal Finette and me, and we went to a place with both Spanish and German food. I was still full from the bratwurst earlier, but joined them in eating some garlic bread. Chris was kind enough to treat us to dinner (thank you!) and after a nice chat, we went back to the hotel to get some sleep. Back in my room, I realized that iPhones don’t work as regular cell phones when it comes to setting the alarm: the iPhone has to be left on to sound at the right time. Scared to turn off the sound as well, I left it on, and tried to get a few hours of sleep before the big day Saturday. Lying in the bed, tossing and turning, many thoughts went through my bed about being in a new city, if I was prepared enough for my presentation etc. I had probably just fallen asleep when I, at 02.48 am, got a text message from my friend, containing just one word. That word was, I later found out, a name of a bar, but at that time I figured he was only drunk or I was completely missing something, and tried to fall asleep again. When the alarm went off, I was completely exhausted, but at the same time, grateful to just get up and get ready; no more time wasted on trying to sleep, but not really being able to. Rey and I were supposed to meet at 8 am to have breakfast, but he called me, being completely jet-lagged, and said he had to sleep one hour longer. Alone, once again, I went down to have breakfast, and was hoping that I’d get some company. Alas, I never got it, so I got a bit needy with a very old English lady, but she was nice and spoke to me for a while. Eventually I called Rey’s room, he was up, and we were to meet just a little later in the restaurant. After Rey’s breakfast, he was a bit stressed to get there in time to get ready to give his keynote, and to make sure we got there right and in time, he persuaded me to take a cab with him. The eventuality we didn’t consider was that the cab driver’s GPS didn’t count with road work, and that he didn’t know where we were going, so eventually we had to give him our map for him to find the way. The location for c-base is accompanied by a myth. 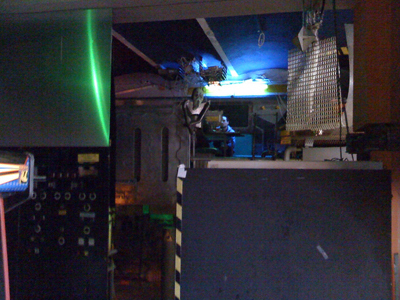 This myth says that there are remnants of a space station called c-base underneath the city centre of Berlin. The space station’s antenna is the Fernsehturm Berlin, a large spire with a mirrored ball near the top and a distinctive landmark nearby. According to the stories of the members of the c-base, the space station crashed due to unstable conditions in its orbit after exiting a time warp. At that time there was a number of highly technological advances and heretofore undiscovered lifeforms aboard the station. 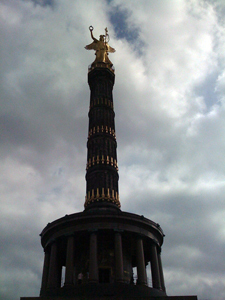 Much evidence of its existence is said to be in and around Berlin, including the aforementioned antenna, which was (according to stories) unmasked by East German and Soviet scientists. Other evidence, such as the multifunctional space station module, which ejected during the crash, is now under intense research and makes up the current premises of the c-base association. When in, we were greeted by some nice Mozilla people, organizing the event: Paul Rouget, William Quiviger, Jane Finette and Barbara Hueppe. I had, in turn, some nice talks with each of them, finding out who they are and what they do for Mozilla. At 11 am we the event kicked off, Paul Roguet and William Quiviger gave us an introduction, and then Rey delivered his keynote speech. It was good to see Rey and I especially got smitten by his amount of enthusiasm and his true conviction of what great things he’s talking about. Also, kudos for bringing up current bottle necks and shortcomings in the Mozilla add-ons web site, and constructively and openly talking about what they plan to do to make it even better. After Rey, Chris Beard beard did a talk about Mozilla Labs, the truly exciting things brewing there, and, for instance, revealed the plans/ideas about integrating some of the Ubiquity functionality right into the awesome bar (URL field) in Firefox. Sounds exciting and very powerful! Time for lunch. I only got a little to eat, just to avoid barfing all over the audience during my talk out of being nervous, and got my things in order. I briefly met Richard Sternagel, who said he reads my blog and was excited to see me talking there. 🙂 Blushing, I thanked him and had to run off to be completely prepared for my talk (hope your talk went well!). My talk was entitled How to Develop Your First Extension (PDF download), and it covered from your first stumbling steps with Firefox extension development to having created a complete working extension. I went through setting up the development environment, recommended folder structure and what parts an extension consists of. I then delved deeper into the different parts and what technologies they were using, and think/hope that I managed to give a pretty good overview of how to do it. My example extension, source code and different presentations formats are available at Bitbucket. After the talk I was in heaven! So many days of preparation and being nervous, a huge weight was lifted from my shoulders! A number of persons asked questions about it, thanked me and some even complimented me (Patrick Finch said the nicest things I ever heard about my talks 🙂 ). During the afternoon, I also got to meet Carsten Book (aka Tomcat), who’s a Mozilla Q&A legendary, and we had the opportunity to talk for a little while. Then I specifically remember Jane Finette being very nice and interested in what I had to say, but I had to blow her off and run with the others to get something to eat: sorry, Jane, I owe you one! When all presentations were over, there was a nice buffet and beer to drink, so I mingled around and spoke to some really nice and interesting people! We were around for an hour or two, but then unfortunately, a majority of the speakers were leaving to get dinner. I would have loved to stick around, but hey, it’s impossible to be at two different places at the same time. For dinner, Rey, Tomcat, Brian, Daniel and I, together with Axel Hecht and Zbigniew Braniecki (aka gandalf), walked to our hotel to leave our computers (and for some people to freshen up), and then in search of a good dinner place. Afterwards, everyone was fairly tired after an intense day, so we went back to the hotel to get some sleep. It was fairly late, and also having in mind the daylight saving time change that upcoming night, which would make us lose an hour of sleep, it was probably a good call. Back at the hotel room, I connected to the Internet to check my flight home, and if I could possibly check in online. I couldn’t, so I checked some other things as well. 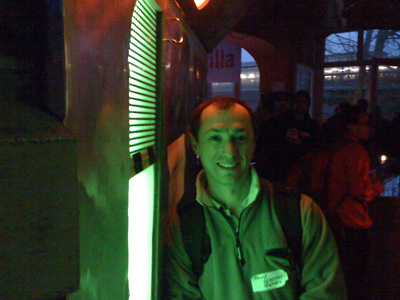 The next day, Sunday, there was to be a hack day at c-base and Paul, William and Rey would be there.Mme, on the other hand, first time visit in Berlin, wanted some time to see the city and Daniel Glazman had the same situation and opinion. We decided to met in the hotel lobby at 10 am to do a walk of the city. With the time change and all, I was afraid I would oversleep, so I turned of any possible automatic time updating I could find on my iPhone, and manually set the new time. Had a good night’s sleep, got up in the morning, ate breakfast and checked out. This was a few minutes to ten, so I was right on time. Perfect planning! When leaving my suit case in the luggage storage, I got the idea to just double-check the time with the hotel staff. Turned out it was only 9 am and the iPhone had set itself one hour forward, in addition to the extra hour I had added (one would think it might be smart enough to compare actual times instead, but no…). This meant that I had to wait an extra hour for Daniel to get ready and meet me, and I didn’t want to call him and possibly wake him just to cover up for my mistake. So, I sat down in a chair in the lobby, contemplating whether I should be doing an hour’s looking around close to the hotel, and then meet Daniel at 10 am, or if I should just sit down and hang out. Against all odds, while still considering what to do, 9.20 am Daniel comes walking by! He was all ready, and just got his things from his room and checked out. Talk about luck! 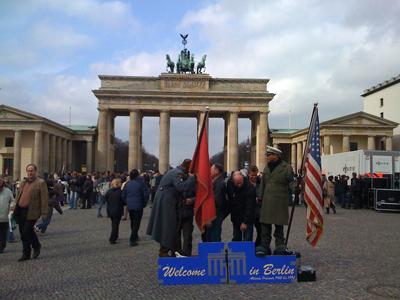 We then embarked on a haphazardly walk across Berlin, with a vague goal of reaching Brandenburger Tor some time during the day. We passed a number of nice street markets, churches, the Berliner Dome and other nice places. I bought a Chai Tea Latte at Starbucks, naturally burned myself and spilled some, all while Daniel was waiting outside with his already finished espresso. 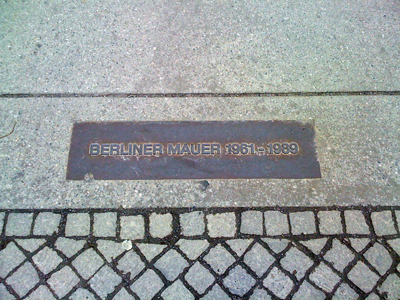 Eventually, we reached Brandenburger Tor, looked around there and at where the Berlin Wall used to be, and then followed Strasse des 17 Juni to the Berliner SiegessÃ¤ule. 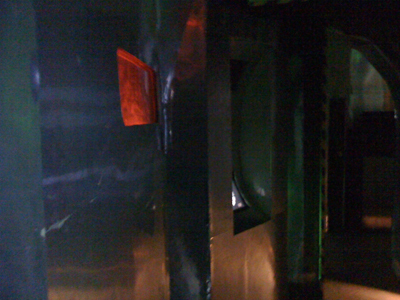 When we got tired of walking, we visited a public restroom which seemed to be built to teleport people, and then had sit-down break at a restaurant (Daniel wasn’t entirely pleased with the waitress mood; I asked him to be nice to avoid spit in my food). Following that, I managed to get some gifts for Fredrika and the children, and Daniel presented me to a nice Italian toy store where everything was made of wood. The excursion ended in Alexanderplatz, where Daniel bought some weird nuts or something, and I had a lovely crÃªpe with sugar, butter and banana. Incidentally enough, Daniel and Paul Rouget had a flight to Paris at the same time as my flight home to Stockholm, so we shared a cab back to the Berlin Tegel airport. The flight home went very fast, although I had an enormously big guy sitting next to me. Airline seats are small, right, and whether he wanted it or not, his arms just had to hang over to my seat. I was sitting next to the aisle, though, so I could lean out and make enough room for me (word of advice: watch the hard and fast food carts passing by!). Also, If anyone’s interested, you can take a look at my pictures from Berlin (only taken with iPhone, next time I’ll bring a real camera). Please also take a look at Daniel Glazman’s great pictures from Berlin! Great summary. Now I can just point people here and don't need to blog it up! It was great meeting you Robert – och vi ses snart igen! Likewise, man! Let's do it again! Ah, no worries. Just a combination of lots of different things to think about. Everybody remembers the Die-Hard movies, but for my movie-going bucks, the best Bruce Willis film is Tears Of The Sun, which didn't do much at the box office but gets to me every time I see it. See, I told you not to sweat the Berlin thing. Piece of cake.